Written by Janet Choi on January 28, 2016 . Email is the ultimate way for a marketer to connect with their audience. Too often what happens is marketers just think about it as a high ROI channel. That opinion leads us down a path of bad behavior, where we look at email like it only has capabilities to make our companies money. Often that comes in the form of shoving promotions, discounts, and deals down people’s throats. Every email is not a sale, though your inbox may show otherwise. Let’s look at what it means to turn your focus from lists to the people behind those rows of email addresses. That kind of list-grinding means that “a lead who’s not on the path to becoming a customer is a distraction,” as Ezra Fisher from Wistia observes. Then, having spent all your attention and effort to entice, the very people whom you’ve worked so hard to get in the door are often abandoned, left to their own devices or bombarded with irrelevant messages. What results is a Sisyphean task of constantly filling up a leaky funnel instead of building momentum with audiences, customers, and fans. What if you flip the funnel over to focus on customers — or go beyond funnel-based thinking, as Wistia does, to focus on audience? These approaches can make your emails much more effective and powerful. Messages don’t resonate when you have to clamor for attention in a large, indiscriminate crowd that keeps turning over. When it comes to email, the shouting-on-a-soapbox approach doesn’t make sense to connect on a personal level. Instead, your probability of success is much higher with specificity and relevance — a personalized approach, carried out over time. When you do the hard work of building and sustaining an audience, your messages go out to people willing to actually listen. A strategy built on ongoing and relevant communication also transforms every email from a do-or-die chance to make a sale into a building block. As Gary Vaynerchuk observes that, “Email is all about delivering on promises.” Whether you simply have a simple newsletter or you’re a big company with a product — getting an email address is just the beginning. Email marketing isn’t just about subscriptions and signups then, but delivering on promises and following through. The marketing and growth teams at Pinterest discovered firsthand how that long-term thinking dims as you get preoccupied with the usual opens and clicks. 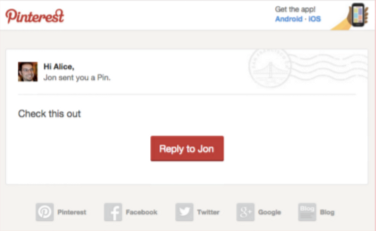 For instance, their “Send a Pin” notification (sent when someone wants to share a pin with you) could have been a simple message that made you click through to find out what the pin was. There would be boosts in clicks and traffic to Pinterest, which sounds great and looks like growth. “If we only looked at email clicks rates, it was an obvious choice: make people come to Pinterest and see the message,” marketer Annie Katrina Lee explains. We opted for our long-term gain (building trust with Pinners) vs. short-term gain (more clicks to Pinterest from this specific email), because we could always find ways to drive more clicks from other growth hacks, but it would be difficult to scalably build trust once it’s gone. 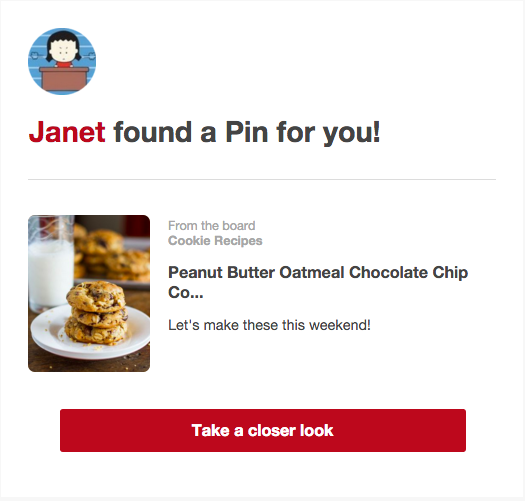 Pinterest’s new Share a Pin notification Once you stop seeing email as a button to push every time you want to squeeze out some more money, more hits, more clicks, more traffic — your goals become clearer and more meaningful and your emails, more helpful and valuable. I hear a lot of horror stories about growth teams hacking new ideas to achieve “hockey stick” growth, but lose brand equity in the process. At Pinterest, we value both our growth rate (how quickly we’re growing) and our brand reputation (how people perceive and feel about us). These goals tend to be at odds with each other, and over time, we’ve learned how to pick and choose our battles wisely. behavioral data: Modern email marketing draws on real-time behavioral data to segment beyond simple demographics to automate and deliver super-relevant, personalized experiences at scale. Tools like Customer.io give marketers much more access and control to harness such data than was ever possible. thoughtful strategy: Automation and data are nothing without humans understanding how to put it all together. When you’re working towards the long-term with flipped funnels and audience focus, “just sending out another email” can’t be your go-to move. Now spending time chasing email opens and clicks, or seeking that best send time or subject line, don’t always make sense. Anyone can send emails; really understanding why and how to send emails is the key. 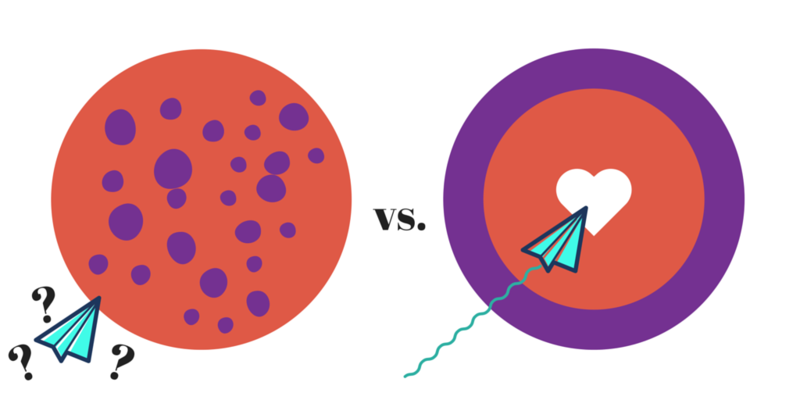 It’s not that you shouldn’t care about expanding your connections and audience — but the persistent fixation on list growth feeds the underestimation of what “good email marketing” looks like. There’s so much that’s challenging, interesting, rewarding, and valuable about email marketing that it’s a shame to reduce that hard work to a few vanity metrics like clicks, traffic, and list size. Every email is an opportunity to connect with real people, improve their experience and provide value, have a conversation, and make a meaningful difference in how they understand and view your brand. That’s much harder to measure, but more vital in the long run. How do you use email to scale trust? Share with us in the comments!